COLORADO, May 20 — A dinosaur fossil expedition for home educators sponsored by Vision Forum and Creation Expeditions has excavated a rare, large, intact Allosaurus measuring more than 22 feet in length, 10 feet in height, with a complete skull more than a yard long. Allosaurs are believed to be a close relative of the Tyrannosaurus rex, and differ from the T. rex primarily in size and cranial capacity. Doug Phillips’ news release was replete with half-truths, lies, fabrications, and stealing credit from the men who had actually been responsible. Even the claim that they’d “spent a week hunting for and excavating” was a lie. In reality they had only spent three days on site excavating. Vision Forum is planning to release a video documentary on the historic Dragon’s Den Expedition in the future. doc·u·men·ta·ry (of a movie, a television or radio program, or photography) using pictures or interviews with people involved in real events to provide a factual record or report. A scripted staged event cannot be a “documentary”; but that’s precisely what Doug Phillips’ video proved to be. He took a film crew on location to video tape a staged event, based on details that he already knew about the dig sites, including what had already been discovered there. He would take credit for his own group doing everything, including the discovery. He took full credit for the excavation. He even took credit for his home school group “raising the allosaur”—even though his tour group was long gone prior to the allosaur excavation. Doug Phillips’ film had been carefully choreographed in advance around his self-promoting agenda. The script was a sham, and the resultant video “documentary” was a fraud – a fraudumentary. Many thousands of Vision Forum patrons purchased Doug Phillips’ video. They made him rich in the process, and not only from just purchasing the video itself. A large percentage were so highly impressed by Doug Phillips’ stunning paleontological success that they purchased many other Vision Forum products, as well. It seemed that the Christian home school community had suddenly found a creationist hero that they could rally behind, and rally they did. 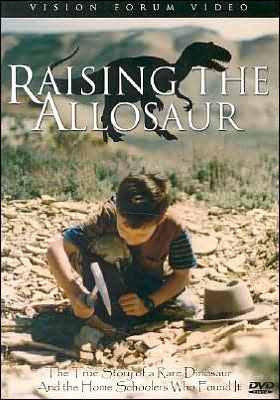 On November 15, 2002, concurrent with the publication of the 2003 Vision Forum Catalog, Doug Phillips and Vision Forum released its “first feature documentary film”, the 60 minute Raising The Allosaur: The True Story of a Rare Dinosaur and the Home Schoolers Who Found It. It’s ironic but not surprising that Phillips selected a title that included the word “True”, for there is very little truth to it. Thus begins the saga in a long train of lies, fraud, stealing credit from and destroying the livelihoods of other men, and legal chicanery that is Doug Phillips’ duplicitous career in Christian film making, film production, and film promotion. Raising The Allosaur formed the backdrop, the very foundation, on which the San Antonio Independent Christian Film Festival was soon thereafter launched in 2004. I watched the video trailer and was impressed. So like thousands of other suckers, I bought the video. I was at the time a fan of Doug Phillips and Vision Forum. Looking back on it now I can plainly see how my biases blinded me to what I was viewing. Anyone who claims they’re “unbiased” is very likely deceiving themselves. We all have biases and we all need to be mindful of how they can affect our judgment. Eventually common sense started overcoming my pro-Doug Phillips biases. As I grew increasingly suspicious about Doug Phillips’ incredible claims, I made calls to Vision Forum. 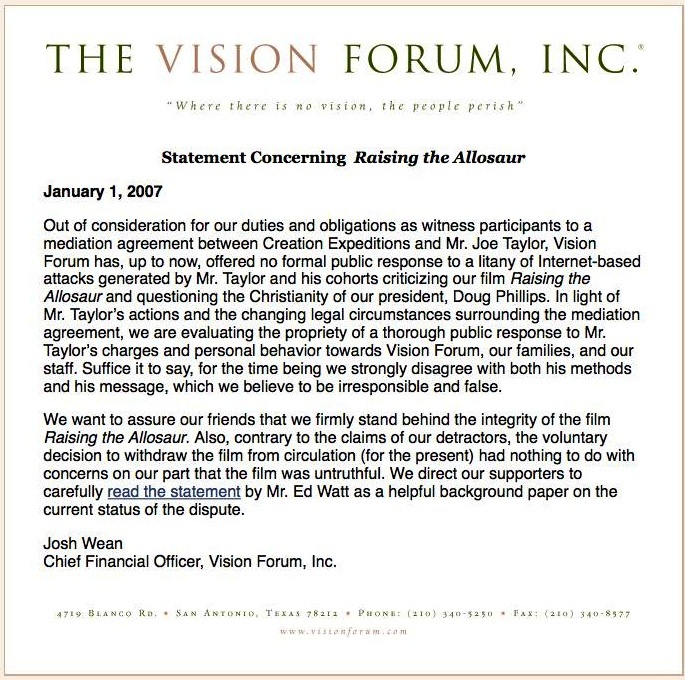 In doing so I encountered doubletalk and stonewalling, especially from Wesley Strackbein (Vision Forum Public Relations Director) and Bob Renaud (Doug Phillips’ Personal Assistant). No one at Vision Forum had any credible answers, and all the while Doug Phillips was hiding in the background, refusing to take any calls or respond to emails. My suspicions only increased that Doug Phillips’ “documentary” must have been a sham. I’m no paleontologist, but I do understand some basics, and one of the basics is that you can’t find a large dinosaur of any kind and excavate it, and raise it, all in the span of a week. Even prior to the actual work of the excavation, such projects require a great deal of preparation. That includes drawing up and executing the necessary contracts between all concerned parties (especially the property owner), surveying the site, equipment provisioning, and logistical support. All that requires money, and this generally means securing financial backing. Because of all these factors it usually requires months, if not several years, to bring a dinosaur excavation project to successful completion. In other words you can’t just show up and start digging and have any chance of raising a large dinosaur. Raising The Allosaur was soon dubbed a “fakeumentary” by those who had personally worked the dig site long before, and long after, Doug Phillips and his home school tour group had made their three-day appearance. Included among them were the property owner, the project director, the surveyor, the logistical support man, the equipment man, and the excavation team. Doug Phillips had big financial problems at the time that he set out to produce his “first feature documentary film”. Just prior to the release of Raising The Allosaur, Dunn and Bradstreet’s fiscal rating of Vision Forum Inc showed that they were over a million dollars in the red. The many thousands of copies of Raising The Allosaur that were sold, along with all the associated dino dig merchandise, including Indiana Jones fedoras, rock hammers, fossils, and dinosaur toys, quickly put Vision Forum in the black. There was no other product line that had ever made Vision Forum so much money so quickly. Raising The Allosaur rapidly became a stunning success, and a very lucrative one too. One would think that Doug Phillips would have proudly showcased Raising The Allosaur at the inaugural San Antonio Independent Christian Film Festival on November 11-13, 2004, as an inspiration to other filmmakers of how Christians should (in Doug Phillips’ words) “take dominion”. Certainly that’s the way he’d portrayed Raising The Allosaur everywhere else. Doug Phillips had aggressively promoted his video to the press, and in numerous home school convention speeches he’d given coast to coast. Yet with the arrival of his first film festival he mysteriously went silent about Raising The Allosaur. Truth is essential to Christian films… Film is an especially powerful medium for communication and should be handled with integrity. Twin brothers Graham & Joel Fisher of Beowulf Studios, who filmed Raising The Allosaur, received the SAICFF’s top award, but not for that movie. Doubts were raised about the objectivity of the judges and whether or not the top award for the 14-minute film short was a payoff for the Fisher brothers’ labors in filming Raising The Allosaur. That was all quite unfortunate because, from all accounts, The Art of Play was a good film. As evidence mounted that Doug Phillips had scripted his entire “documentary” on falsehoods, Raising The Allosaur became a tremendous career embarrassment to the Fisher brothers. More than likely the Fisher twins were guilty of no wrongdoing, other than youthful naiveté. Oddly enough Raising The Allosaur was never mentioned at the SAICFF, or anywhere else, and it would never be mentioned by Doug Phillips again. For reasons never explained, Doug Phillips abruptly pulled Raising The Allosaur from the Vision Forum web site and catalog, immediately prior to the inaugural launch of the SAICFF. Q: What happens when a group of home school boys and girls travel to the badlands of Colorado with their parents in search of adventure and the hope of finding ancient treasures buried in rock? In the fall of 2000 Dana Forbes discovered an Allosaur on his property located in the Skullcreek Basin of northwest Colorado. The Allosaur was subsequently excavated under the direction of creation scientist Joe Taylor and his team from the Mt. Blanco Fossil Museum (Crosbyton, TX). 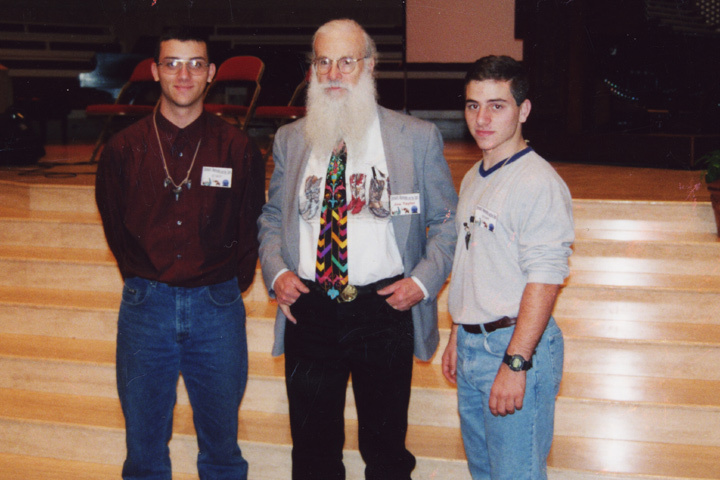 Assistance was provided in 2001 by Carl Baugh from the Creation Evidence Museum (Glen Rose, TX), the Derosa Family from Creation Expeditions (Crystal River, FL), and in 2002 by a homeschool tour group from Vision Forum. After the excavation of the Allosaur was complete Vision Forum and Creation Expeditions made and released a documentary titled “Raising the Allosaur”. Controversy and criticisms about the film surface quickly because of many inaccuracies that were present, the most notable of which was the failure to give any credit for the excavation to the directing paleontologist Joe Taylor. After the exposure of ethical violations the film was pulled from the market in October of 2004. So who discovered the dinosaur? 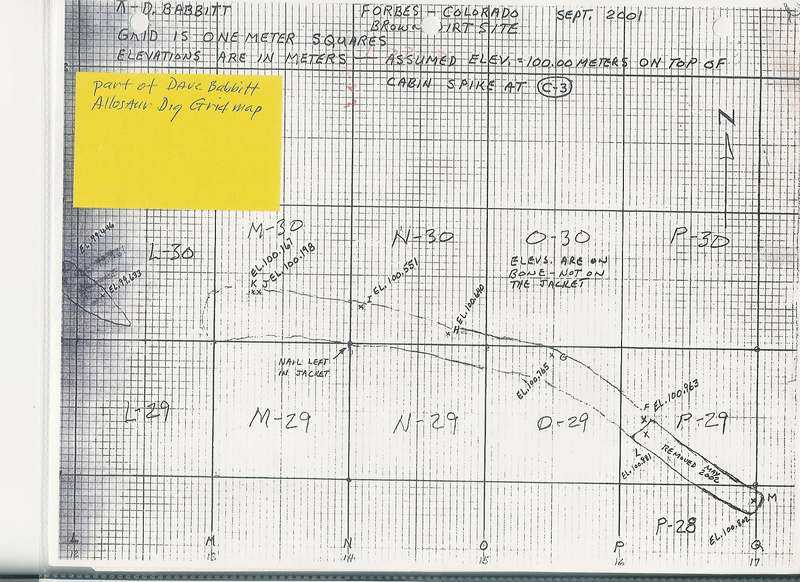 The Colorado property owner himself, Mr. Dana Forbes, and that happened in October 2000. Dana Forbes removed two of the dinosaur’s vertebrae at that time for later identification. In 1999 Dana and his wife Brenda had acquired just under 70 acres in Massadona, Colorado, just east of Dinosaur National Monument. It wasn’t long before Dana started uncovering dinosaur bones. As a creationist he wanted to use the property for advancing the cause of creationism. In early 2001 the Denver Post ran an article about the Forbes property and his Dinosaur Excavations. That article gave him considerable exposure and helped him sell fossil dig tours. Several radio interviews came shortly after the Denver Post article. Two National Geographic photographers made arrangements with Dana to come out in May 2001 and shoot photos of his conducting a dig. In June he was contacted by The Today Show to arrange for an on-site interview. It seemed the Forbes were well on their way to having a successful fossil dig business; but their most important concern was that their property be used to bring glory to God. Dana also knew that he would need the help of a skilled paleontologist in order to properly excavate and restore the large dinosaur bones that he knew were on his property. Word of Dana’s property started getting around the creationist community. Dr. Carl Baugh visited with the Forbes on May 20, 2001 at their property. He recommended that the Forbes work with the professional dinosaur paleontologist, Mr. Joe Taylor of the Mt. Blanco Fossil Museum. Taylor and the Mt. Blanco team were working at Baugh’s dig site just a few miles away. The next day Taylor and members of his team were introduced to the Forbes at the Forbes’ property. Dana Forbes produced several dinosaur bones for Taylor to examine. Taylor identified two vertebrae as being an Allosaurus. Taylor was soon thereafter contractually assigned as “Chief Excavator” for all work on the Forbes’ property. Excavation assistance was indeed provided, in part, by Pete DeRosa’s Creation Expeditions, comprised of himself and his two sons Pete Jr. and Mark DeRosa. Doug Phillips and his home school tour group also assisted in the excavation, for three days. The contributions of Joe Taylor and his Mt. Blanco team, as well as significant contributions made by others were, apparently, of such minor consequence in Doug Phillips’ mind that none of them merited any mention at all. Doug Phillips rationalized that the minor contribution made by Pete DeRosa and his two boys, as well as the three days of work by the Vision Forum home school tour group, was so significant that it merited taking 100% of the credit for everything. Please consider these corrections. If Ken Ham or the Australians see one little mistake they might denounce your work, and you don’t want that. 11. Not to take anything away from Vision Forum’s story, but, Mt. Blanco has been working world class sites for many years. We have made them available to ICR, AiG, CSI, Bryan College, and many more creation groups, inviting them to take advantage of our sites for years, though with little success. We have been excavating on as many as a dozen dinosaurs and one mammoth for Carl Baugh’s Creation Evidence Museum for the past eight years or more. Last year alone, we excavated a large mastodon tusk, and two mammoths, not to mention the Allosaurus. We continued work on the 10 animals at Carl’s Colorado dig. And our new T-rex site in Montana this spring is ongoing. I’m not looking for y’all to say anything. I am just informing you so that someone doesn’t come up and ask any embarrassing questions. All of this prudent advice came some four months prior to the release of Raising The Allosaur. Had Doug Phillips heeded Joe Taylor’s advice it would have saved Doug Phillips all those “embarrassing questions”. But a man who is greedy for gain isn’t one to listen to the voice of reason. Concerning the remaining points, Doug wanted me to assure you that it is never his desire to rob another brother of the glory due to him, but that it has always been our understanding based on his relationship with Pete and Creation Expeditions, that this dig from beginning to end has been a Creation Expeditions dig for which you were an important part of the support team. Consequently, the information was not meant to exclude Mt. Blanco, but to emphasize Creation Expedition team which oversaw the project and was yoked with Vision Forum during the week that the Allosaurus skull was discovered. The articles were cleared with Creation Expedition and represent our best attempt to promote an accurate overview of the situation and to draw attention to the importance of this find which culminated with the dig that occurred during the week that Vision Forum and Creation Expeditions sponsored our joint dig. He mentioned that because of the formal working relationship between Creation Expeditions and Vision Forum, that any concerns should be discussed with Pete, from whom we take our queue. This is absurd! Pete needs to have another talk with him. It’s probably not as though Doug Phillips even comprehends that he’s lying. Doug Phillips probably really does believe the entire story that he’s fabricated. This is precisely how the mind of a pathological liar works. Once a pathological liar fabricates a story in his mind, no facts, or evidence, or testimony to the contrary will ever convince him otherwise. Doug Phillips had even written the script for his video so, therefore, it all had to be true. Doug Phillips probably even believes it when he says, “Doug wanted me to assure you that it is never his desire to rob another brother of the glory due to him”, even though that’s exactly what he was doing, and would continue doing. As portrayed in Doug Phillips’ fraudumentary, it’s as though Joe Taylor and the Mt. Blanco team weren’t even there. Not only was Joe directing the entire project, he and his Mt. Blanco team had been there working on the site for weeks prior, including also working the site the prior year. They would continue working on the site for some time after Doug Phillips and his home school tour group had gone home. This is classic Doug Phillips modus operandi – steal the credit from those men who actually deserve it, but give credit to himself, and to men who deserve very little credit in order to cement strategic business partnerships from which he can financially profit. Pete DeRosa had partnered with Doug Phillips to have Vision Forum use its half-million-name mail list to sell dino dig tour packages for $995 per person, the profits of which they would split between them. The profit motive from selling tour packages, as well as the profit from selling a “documentary”, became Doug Phillips’ overarching concern, and he would allow nothing to stand in the way of that. Doug Phillips’ insatiable greed would completely undermine what should have been a significant advancement for the cause of creation science. In the process Doug Phillips would ruin the livelihoods of a number of men who had dedicated themselves to the cause of creation science. This claim was reinforced in the video. Doug Phillips is speaking here of having first met the Pete DeRosa family on October 6, 2001 in Tampa Florida at the Back To Genesis Conference hosted by Institute for Creation Research (ICR). Pete DeRosa was Field Agent for Creation Studies Institute (CSI), founded by Tom DeRosa (no relation to Pete) and was supposedly representing CSI at the conference. As it turns out he was only representing his own interests, but doing so on CSI’s credit card. In all likelihood it was at this ICR conference that Doug Phillips first entered into a conspiracy with Pete DeRosa to claim credit for the Dragon’s Den Allosaurus that had been discovered on Dana Forbes’ property the year before. When Doug Phillips first met Pete Jr. and Mark DeRosa at the Back To Genesis Conference, they were 18 and 17 years old respectively. Doug Phillips portrays the two as not just paleontological prodigies, but prodigies who had accomplished something that most elderly seasoned paleontologists who have spent much of their lives in the field haven’t accomplished: “hundreds of digs under their belt”. Why is it that Doug Phillips gave the students in training total credit, but their teacher Joe Taylor, who was also directing the dig, wasn’t mentioned or shown in the video a single time, not even in the film credits? Amazingly enough, even the DeRosa’s dog is given film credit! No doubt much of it had to do with Doug’s tour package partnership with Pete DeRosa. “For the love of money is the root of all evil”. The very title of the movie, Raising The Allosaur, is duplicitous. We are never shown any video footage of any Allosaurus bones being excavated, let alone any bones being raised, nor of the other two dinosaurs mentioned in the video. There are a few still-photos inserted toward the end of the fraudumenatary, but for the most part they aren’t even representative of what Doug claims they are. For example a photo that Phillips claims is of “loading the skull” was actually taken the year before of the Mt. Blanco team moving the tail down the hill to be loaded on a truck and carried off to Mt. Blanco for restoration. The strange absence of any video footage showing the raising of any allosaur bones isn’t due to any lack of video footage having been taken of those events. There is plenty of footage of the excavation, field jacketing, raising, and loading of Allosaurus bones into the truck to take them to the Mt. Blanco Fossil Museum for restoration. The problem for Doug Phillips is that all that video footage was taken by the Mt. Blanco team, and it tells a completely different story from what Doug Phillips tells in his fraudumentary. Doug Phillips knew of the Mt. 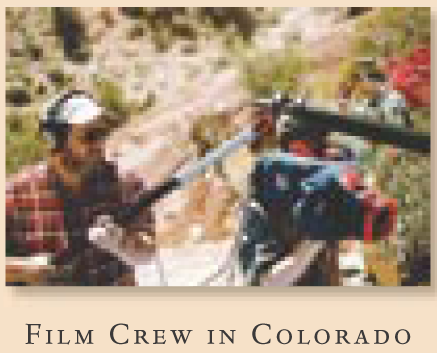 Blanco team’s extensive video footage and photos but never contacted Joe Taylor to receive copies of any of it, and for good reason – it would have been impossible to use any of it while continuing to portray that Phillips and his home schoolers were responsible for discovering, excavating, and raising the allosaur. In order to counter the lies contained in Raising The Allosaur, Joe Taylor began the process of creating his own documentary, The Truth About Raising The Allosaur. However, due to legal threats and coercion by Doug Phillips, Joe Taylor was prevented from releasing his own video documentary. Further debunking Doug Phillips’ claim that, “They [the Vision Forum tour group] make the biggest dinosaur discovery of the year”, as well as the film’s subtitle, “the Home Schoolers Who Found It” is the fact that a large portion of the Allosaurus had already been removed in September 2001 when some 12 feet of the Allosaurus’ vertebrate was dug up, field jacketed, and transported to the Mt. Blanco Museum for restoration. The dig team consisted of Joe Taylor (Mt. Blanco Fossil Museum), Don Yaeger (Mt. Blanco), Don Ensign (Mt. Blanco), Dave Hall (Mt. Blanco), Phillip Hall (Mt. Blanco), Jordan Hall (Mt. Blanco), Chantell Lines (Mt. Blanco), Tom DeRosa (President, Creation Studies Institute, no relation to Pete DeRosa), Mike Zovath (VP, Answers In Genesis), Stephanie Zovath (AiG), Buddy Davis (AiG), Dave Babbitt (professional surveyor), and Terry Beh. Assisting and being trained by Joe Taylor were Pete DeRosa, Pete Jr. and Mark DeRosa. This happened some 7 months prior to Doug Phillips and his home school tour group even showing up. Doug Phillips knew this, and yet his “documentary” portrays that it was his home school group “Who Found It“. Douglas W. Phillips, Esq. was at the center of fomenting that “partisan wrangling and selfish positioning for profit and control.” Doug Phillips was the fly in the ointment that spoiled and ruined what should have been a significant paleontological discovery for the creationist cause. It didn’t make sense at the time; but after the release of Raising The Allosaur it all started adding up. Doug Phillips had arranged to shoo everyone away from the dig site for two days so that he could get enough footage for his scripted and staged fraudumentary, minus all the numerous people who were actually responsible for the dig. “The evidence strongly points to a relatively recent and catastrophic event similar to that described in the Bible as the Flood of Noah’s day,” said Pete DeRosa. 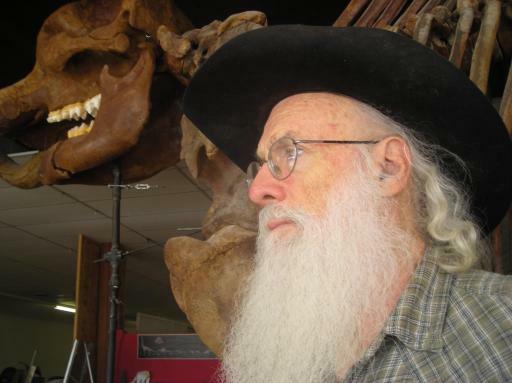 Doug Phillips masquerades as a creation scientist, and in particular a young-earth creation scientist. However, because of his “selfish positioning for profit and control” he brought scandal, shame and disrepute to the entire field of creation science, like no one ever had before. Nobody has ever sabotaged creationism like Doug Phillips has. The Darwinists never had a better friend. For the majority of Vision Forum patrons, the sudden disappearance of Raising The Allosaur piqued few concerns on their part. All was soon forgotten and anyone who continued raising concerns about it was branded “a gossip“, “hateful” and “bitter”. That’s exactly how Joe Taylor was portrayed. Doug Phillips even claimed that “internet assassins” were attacking not just him, but his family too. No one, other than Doug Phillips, had even mentioned anything about Beall and the Phillips children. They had nothing to do with Raising The Allosaur. Doug Phillips has made a lot of money marketing “women and children first”. Yet he won’t hesitate playing the victim by invoking the names of his wife and children, using them as human shields to deflect criticism away from himself. His whiny and unmanly family victimization stories were countered by accusations that he was just hiding behind his wife’s skirt. Indeed, that’s exactly what he was doing. Doug Phillips is a hypocrite and a fraud. Doug Phillips is a self-serving man who is eager to steal credit from others. Doug Phillips uses people for his own selfish gains, stealing credit for things he has no personal responsibility for. While using others they are made to feel like they are the best of friends. Once he’s done using them he discards them and treats them as enemies. Being a religious sociological cult leader, Doug Phillips has often made a show of his religiosity. He rationalizes his sinful behavior by twisting and perverting God’s Word for his own selfish objectives. Doug Phillips promotes/markets various causes, such as creation science and Christian home education, not out of genuine personal conviction, but out of greed and personal enrichment. Doug Phillips has discredited the very causes that he claims to support, such as Christian home schooling and creation science. He has brought great shame and humiliation to those who support those causes. When confronted for his duplicity and corruption Doug Phillips throws his “Esq.” around and threatens to sue for defamation. He is a litigious bully and makes a mockery of the American justice system, not to mention what the Bible has to say (1 Cor 6:6-8). None of these things are recent developments. Doug Phillips has been this way since he arrived in San Antonio in 1998, and likely for some years prior. The fact that he stole the HSLDA mail list from which he launched Vision Forum is a clear indication of that. I know of many people Doug Phillips has under Non-Disclosure, including former Vision Forum Interns, former Vision Forum employees, and former business associates. The total number is in the dozens, if not hundreds. These people live in fear that if they say anything derogatory of Doug Phillips, no matter how truthful and factual is it, he will sue them for defamation. Proving a defamation case is far more difficult than most people realize. Most plaintiffs lose such cases. Nevertheless, our “justice” system permits filing such lawsuits, no matter how lacking in merit a case may be, and many people have been financially ruined defending themselves in the process, even when they win. The mere threat of such legal action has frightened most people from coming forward and sharing what they know about Doug Phillips. Joe Taylor is one of those rare people who hasn’t been afraid to speak out. I’ve spoken before of the fact that Doug Phillips is a religious sociological cult leader, and that like so many other cult leaders he employs various mind control techniques to keep his followers docile and compliant. Instilling fear is one of the most common control tactics used by cult leaders. One method Doug Phillips has used to instill fear at Boerne Christian Assembly and Vision Forum is imprecatory prayer. Anyone subjected to hearing their spiritual leader from his pulpit call down on his enemies the wrathful judgments of God is being subjected to a powerful form of mind control. Such cult members live in fear that, should they ever defy the will of the leader, they too will be singled out by name and cursed from the pulpit. Jen Fishburne has stated that, while she and her family were members, they regularly witnessed Doug Phillips leading Boerne Christian Assembly in imprecatory prayers, calling down the vengeance of God on numerous people, including Joe Taylor. I don’t believe that God answers such prayers, but members of religious sociological cults do. This story is such a tangled web of duplicity and legal chicanery that I have found it quite challenging to cover the subject matter adequately in just one article. However, I’ve put forth my best effort to condense the most significant issues here. With respect to the Allosaurus, it should be noted that Pete DeRosa of Creation Expeditions is probably as guilty of fraud and duplicity as Doug Phillips. Phillips couldn’t have pulled off his fraudumentary without the aid of DeRosa, and DeRosa couldn’t have pulled off his scams without the backing of Phillips. Indeed, not only were they co-conspirators in defrauding Joe Taylor and others of the notoriety and rights to the bones they deserved for discovering and excavating the allosaur, but from the significant amount of income that should rightfully have gone to them. On top of everything else they caused immense injury to the Forbes family, both financially and to their emotional health. The Forbes were ultimately forced to abandon their dreams and sell off their property. Raising The Allosaur provided Doug Phillips, and to a lesser extent, Pete DeRosa, with a great deal of undeserved fame and fortune. To this date neither Doug Phillips or Peter DeRosa have ever admitted to their deception or confessed their sins related to this matter, much less repented, apologized and made restitution to those they so grieviously injured and robbed. This blog is focused on Doug Phillips, which is why this article hasn’t gone into a great amount of detail on Pete DeRosa. Moreover, it’s not particularly necessary since Pete DeRosa has already been exposed through the efforts of Randy and Mary Gavin at Raising The Truth. Perhaps the single most valuable resource that the Gavins have provided are their Video Interviews With Those That Excavated The Allosaur. Those interviews directly corroborate this story and are well worth reviewing. Some may ask, “Why are you telling this story when others have already told it before?” Yes, others have told this story before, but (with no disrespect intended toward anyone else) quite frankly, I haven’t seen anyone tell it very well. In my view it’s an extremely important story and it’s deserved considerably more effort than I’ve seen anyone else put forth so far. Perhaps an entire article on the naive philosophy that inspires such questions might also be in order. For the time being let me just say that no one should be so gullible as to believe that Doug Phillips is “down for the count”, as though that means he will stay down. Doug Phillips will be back, or at least he will try very hard to make a comeback, and we should look for that to happen in 2-3 years. Make it one year if he’s especially audacious about it. Rather than being the time to “let it go” this is the time to draw attention to at least some of the most significant things Jen and others have been trying to expose about Doug Phillips for years, but for various reasons those warnings went largely ignored. Now is the time because now it’s not as easy for people to ignore those warnings, as it was in the past. Many charismatic cult leaders, like Doug Phillips, have gotten away with horrendous sins and even crimes, often for many years, largely by maintaining a highly polished public image. Even when a scandal does erupt, such as the Raising The Allosaur scandal did back in 2004, a brilliant cult leader like Doug Phillips, with virtually unlimited resources at his disposal, and aided by his in-house PR team, can often clamp the lid down hard on a scandal and reduce to it a mere “misunderstanding.” In Doug Phillips’ case he can even turn it around and claim that he’s the victim, and that his family is being attacked (even though that never happened), thereby gaining him even more support from the gullible. Because of the gullibility and trusting nature of many of his followers, it requires many proofs to convince them of the true character of Douglas W. Phillips, Esq. and, in my view, Raising The Allosaur is a key part of that. Cheating on his wife for a dozen years, all while making millions of dollars promoting marital fidelity and biblical family values, would be another such example of the magnitude of Doug Phillips’ hypocrisies. The problem is that in a year or two too many people will only remember it as an “extra-marital affair”, rather than the clergy sexual abuse that it really is. Even now there are too many claiming that, “It could have happened to any of us.” However, few of us could have perpetrated and profited from such a fraud as represented by Raising The Allosaur without a tinge of conscience, as Phillips has. It helps reveal a despicable pattern of abuse of power, deceit and manipulation, and I shudder when I hear people trying to trivialize such egregious sin by a “Christian leader”. There are extremely valuable lessons to be learned from Raising The Allosaur, not only about Doug Phillips’ true character, but also about wolves in sheep’s clothing, in general. If Christians refuse to learn anything from stories like this, then it’s certain that Phillips—and others like him—will have no trouble making comeback after comeback, and continue to prey on the innocent. And that is neither just nor right.